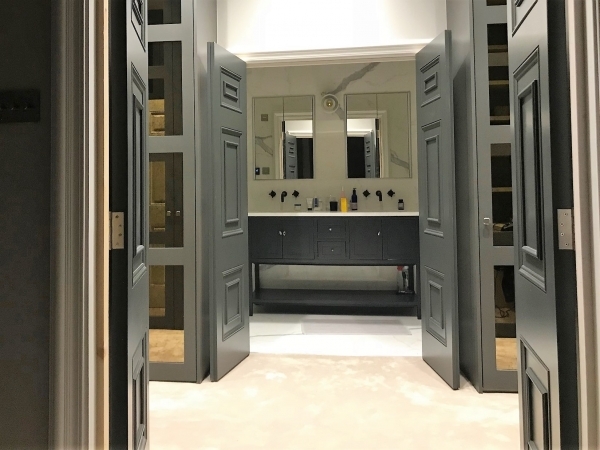 At Trunk doors we supply primed doors that are ready for the custom to apply paint, so in this guide we provide some tips and tricks for choosing a colour for interior doors and trim. Choosing paint can be dependant on what look and style you trying to achieve for your home. For a classic feel white is a popular choice due to its crisp, fresh appearance. Using the colour white give a timeless look and helps to accentuate archways and moldings. For a subtle feel paint the trim, use a colour that is either one shade lighter, or darker than your walls. This in fact is a neat little trick to help the space appear to be larger. For a statement archway of frame, add a bold, brash colour to contrast the room. This makes the trim and door stand out, it becomes a central feature within your room. This works well for bespoke and made to measure doors as they are often a feature of a home.